With the U.S. House preparing to vote on a proposal to repeal and replace the 2010 Affordable Care Act, Republicans continue to overwhelmingly oppose the law, and most say it’s not the government’s responsibility to make sure all Americans have health care coverage. But the views of lower-income Republicans stand out: They are somewhat more likely than higher-income Republicans to support the health care law, and many say it is the government’s responsibility to ensure that all Americans have coverage. 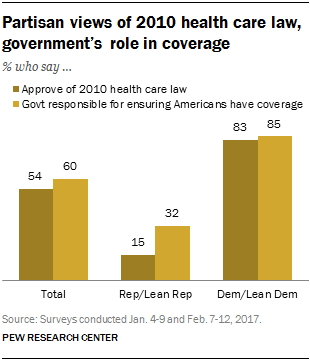 Just 15% of Republicans and Republican-leaning independents approve of the health care law passed by President Barack Obama and Congress; a greater share (32%) says the government has a responsibility to ensure health care coverage for all Americans. Among Democrats and Democratic leaners, comparably large majorities approve of the health care law (83%) and say the government is responsible for making sure all Americans have coverage (85%). Overall, public support for the Affordable Care Act – which was signed by Obama seven years ago today – is at its highest point on record (54% approve of the law), according to a Pew Research Center survey last month. In a separate survey in January, 60% said the government has a responsibility to provide health coverage for all, the highest share in nearly a decade. 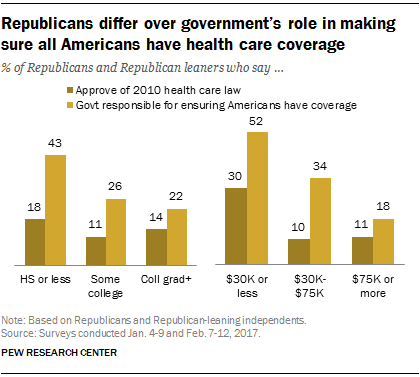 While Republicans are less likely than Democrats overall to say they approve of the 2010 health care law or to say that the government is responsible for ensuring health care coverage, there are key differences among Republicans on these questions, particularly by income and education. Republicans largely disapprove of the law across levels of educational attainment, but views of the government’s role in ensuring health care coverage vary widely by education. Republicans and Republican leaners with no more than a high school diploma are nearly twice as likely as those with a college degree to say ensuring health care coverage is a government responsibility (43% vs. 22%). Lower-income Republicans are both more likely to say they approve of the Affordable Care Act and to say the government is responsible for ensuring health care coverage than higher-income Republicans. Three-in-ten of those with family incomes of $30,000 or less say they approve of the law, and about half (52%) say the government has a responsibility to ensure health care coverage. This compares with just 11% of Republicans with household incomes of $75,000 or more who approve of the law, and 18% of this same group who say the government has a responsibility to ensure that all Americans have health care coverage. Among Democrats, three-quarters or more of those in all educational and income groups both approve of the Affordable Care Act and say ensuring health care coverage is a government responsibility. Samantha Smith is a research assistant focusing on U.S. politics and policy at Pew Research Center.